We truly live in a lost world. We live in a world that has rejected God. The problem is that worldliness has infected the church. Our churches tend toward looking like the world, rather than the authentic Christianity of the New Testament. Melvin Tinker in his new book, A Lost God in a Lost World, tackles these issues in a clear and effective way. The solution is to make less of the world and to make more of God. In that vein, Tinker addresses a number of problems that exist in the church and the solution that is rooted in God. He begins by addressing the weightiness (the immense glory of God) and why that should root out the problem of idolatry in our lives. Tinker articulates key points on the necessity of the cross, of Gospel proclamation, of grace, and of being heavenly minded. In sum, Tinker offers us a mini-systematic theology complete with the problems that exist in sinful man (and in sinful churches) and the solution rooted in various points regarding who God is and how God operates in the world. David Wells in the forward writes, “If our vision of God is clouded, or our knowledge of him is deformed, living in a hostile cultural climate becomes an unequal contest.” Surely, we live in a 1 Peter context with a hostile culture around us. The solution is not to mimic that culture but to live out a unique culture rooted in the supremacy and majesty of the Triune God. To get there, Tinker simply reminds us of the beauty and majesty of God from the Word and reminds us of it’s significance for serving as our framework for life and the church. If you’re like most in the church, you’re concerned by the lack of growth; both in our own lives, and in our churches. Tinker will remind you the solution is not in fads or programs or in mimicking the culture, but instead is in a bigger picture in our hearts and minds of God. While some more detail on how that would look (rubber meets the road) would be helpful, overall, he sets a good foundation for us to work on in each of our contexts. Highly recommended. One of the areas in which most of us are poorly trained by the seminaries is counseling. We spend much time studying good and important things, but considering the inordinate amount of time that most pastors spend on speaking Gospel truth into people’s lives, you’d think we would do a better job of preparing people to do just that. I’m finding in 15 years of ministry, that I’m woefully under prepared for the counseling that I do, and that I am looking for further training. What is wonderful though, is that there is a great abundance of resources being published to help address these most pressing needs. Robert Kelleman, in his new series, Equipping Biblical Counselors from Zondervan is filling a large gap in those resources. His newest, Gospel Conversations: How to Care Like Christ, is exceptional, not just for pastors and counselors, but for all in the body of Christ who want to minister like Jesus did. Kelleman’s previous book in the series, Gospel-Centered Counseling: How Christ Changes Lives and another companion book edited by himself and Jeff Forrey, Scripture and Counseling: God’s Word for Life in a Broken World (both from Zondervan), offer helpful resources to most pastors and counselors and the dedicated layperson. The first offers a helpful look at the entire counseling process and the theology behind it, in particular, the 8 ultimate questions of life to apply Christ’s truth to, and whereas the second devotes copious resources to understanding how biblical counseling uses God’s Word as it’s source. Both are excellent, but where Gospel Conversations shines in that it is designed for all of us in mind. Gospel Conversations, though is written as a second work following Gospel-Centered Counseling, in that it is the continuation of that discussion and bringing what we’ve learned into actually doing counseling. 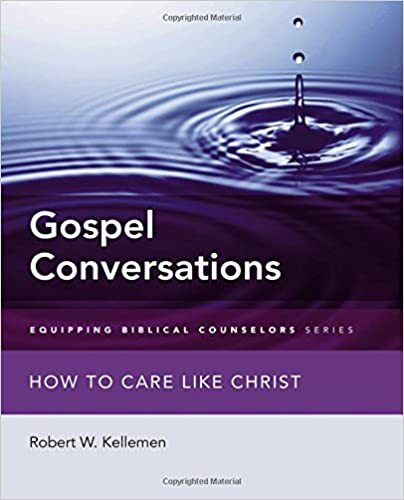 The beauty of this though is taking the principles that Kelleman lays out and seeking to apply them to all our Gospel conversation, not just to the formal counseling situation (think Tripp’s, Instruments in the Redeemer’s Hands). Kelleman uses these four points to build off speaking the truth in any Gospel-focused conversation, whether it be formal counseling or simply speaking to a brother or sister. All of these points, rooted in God’s Word, provides a helpful map of helping each person in each situation. So many Christians, “don’t know what to say,” when people are hurting. Myself, with the recent loss of our unborn baby, struggled through some severe depression. So few had anything helpful or sustaining to say from God’s Word. How wonderful would it have been been to hear the kind of words outlined above through that acronym, and which Kelleman develops further, to help to sustain me in my dark depression? Keep in mind, this isn’t an easy book. It’s certainly prepared as a textbook format, and Kelleman, while offering some foundations of biblical counseling in the beginning, also presumes we’ve got a good understanding of those foundations before we begin. That being said, for those who are interested and willing to be stretched and grow in how they speak Gospel truth into people’s lives will be richly rewarded, not only through how they apply the Gospel in their own lives but how they apply it in each others as well. You’ll apply Gospel truth to a number of real situations that will shape how you apply those same truths to those whom you meet. Are you frustrated that you “don’t know what to say,” or frankly, that what you do say is unhelpful (often too, the case for Christians), then I would recommend Gospel Conversations, as a helpful tool to train you to speak the Gospel into any and all of life’s circumstances. You are currently browsing the Working out Salvation with Fear and Trembling blog archives for November, 2015.